This year is the hundredth anniversary of the last Emperor, Karl, standing down as Emperor of the Habsburg Empire. Within the history of the Habsburg Empire, there has always been a history of tension and rivalry between the nationalities that made up the Habsburg Empire. The Habsburg Empire during its history was predicted by its contemporaries, that it was a doomed empire, just waiting to fall apart, and the only thing that keeping the empire together was the Emperor. Since the 1990s, an alternative view of the Habsburg Empire was that the empire bought many benefits to its population, including democracy. However, with the outbreak of the 1st world war, the empire found that it could no longer cope, and lost control as a consequence of the burden of the 1st world war. On the Balkan front, the Hapsburg armies were confronted by harsh terrain and overconfidence, and in the initial campaign against Serbia, a lot of the professional were casualties. With the initial setbacks, many Hapsburg units were transferred from the Russian front and transferred to the Balkan front, which eventually resulted in an Hapsburg victory, with the Serbian army retreating to the Island of Corfu. Atrocities were committed by both sides, with many Serbian civilians being executed by the Hapsburg armies. On the Russian front, it was regarded by the Hapsburgs, as their most important war front, with the Hapsburg concentrating their main armies and resources. The Hapsburg commanders made many blunders, which resulted in severe casualties and loss of Hapsburg territory. The Hapsburgs regarded the Russians as savages, but in 1915, the Hapsburg armies succeeded in capturing Galicia, but as the war continued, the Germans increasingly took control of the Russian front. 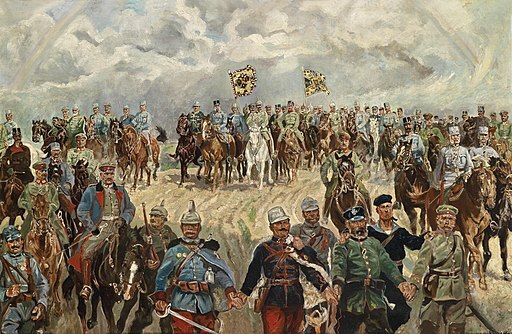 The Italian front was regarded as the least important front, in comparison to the other two fronts, and therefore thought, with this front, that they had two options; either fight a defensive war, or aim for a quick and decisive victory, so that the Hapsburgs could concentrate their armies and resources to the other two fronts. Italy’s objective was to seize Hapsburg’s lands, including the Tyrol and present day Croatia and Slovenia. Most of the fighting took place in the mountains of northern Italy, which resulted in terrible logistics problems. However the Hapsburgs regarded serving on this front as popular, as this was regarded as a ‘relaxed and less dangerous front’. On the home front, the local population needed to believe that the war was going well. Wooden statues of soldiers were erected in a every village, to encourage the local people to continue to support the war. The Hapsburg dynasty was the glue that held the Hapsburg empire together, In 1867, the Hapsburgs gave Hungary a measure of self rule(Home rule). This lead to the consequence that in the 1st World war, it became increasingly harder to run a war with two governments. The death of the Emperor Franz Joseph was not critical to the war, as the Emperor was regarded as distant. The new Emperor was popular with the Hapsburg armies, but not so popular with the Hapsburg establishment. The new Emperor attempted to approve the new changes, but found it almost impossible to impose the necessary reforms through the establishment. The new Emperor granted amnesty to political prisoners, but was unable to influence political policies, as well as being unable to resolve the growing food shortages and the growing political instability within the empire. Hungary becomes increasingly putting its own influence first, rather than the empire, and the Hapsburgs end up, having to ask Germany for help with the food shortages. In Austria, there is greater military control, unlike Hungary. In 1915/16, the Austrian government starts to implement a policy of ‘Germanising’ Austria, which was not popular with the Czechs. The population become increasingly wanting to come to an end. New nationalists were becoming active, with the unpopularity of the war, and as a result, the nationalists were becoming popular and radical. The Czechs, resented the Austrian policy of Germanisation, and the other nationalities were also wary of the Empire’s policy of Germanisation.